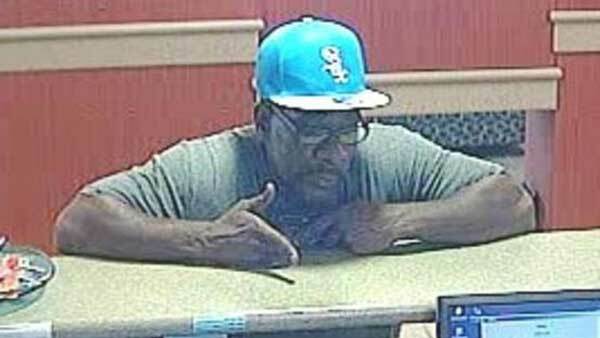 WAUKEGAN, Ill. (WLS) -- Waukegan police are searching for a man suspected of robbing the same bank twice in a week. Surveillance images show the suspect robbing a Fifth Third Bank branch in the 800-block of South Waukegan Road around 1:45 p.m. Monday. Police said the same man robbed the same bank just before 3 p.m. on Aug. 3. He got away with cash, but officials did not say how much. The suspect is described as an African American man in his 40's. He is between 5 ft. 2 in. and 5 ft. 5 in. tall and weighs around 140 pounds. He was wearing a baseball cap in both robberies. The FBI and Waukegan Police Department's Criminal Investigations Division are investigating. Anyone with information regarding these robberies should contact the CID Tip Line at (847) 360-9001.